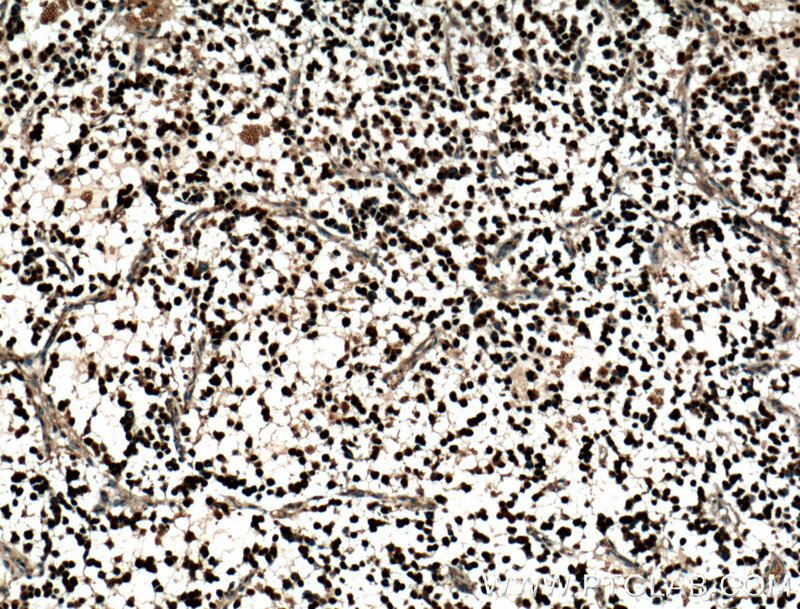 Immunohistochemistry of paraffin-embedded human gliomas tissue slide using 25754-1-AP (OLIG2 antibody) at dilution of 1:200 (under 10x lens) heat mediated antigen retrieved with Tris-EDTA buffer(pH9). The oligodendrocyte lineage-specific basic helix-loop-helix (OLIG) family of transcription factors include OLIG1-OLIG3, which differ in tissue expression. OLIG1 and OLIG2 are specifically expressed in nervous tissue as gene regulators of oligodendrogenesis. OLIG1 and OLIG2 interact with the Nkx-2.2 homeodomain protein, which is responsible for directing ventral neuronal patterning in response to graded Sonic hedgehog signaling in the embryonic neural tube. These interactions between OLIG proteins and Nkx-2.2 appear to promote the formation of alternate cell types by inhibiting V3 interneuron development. 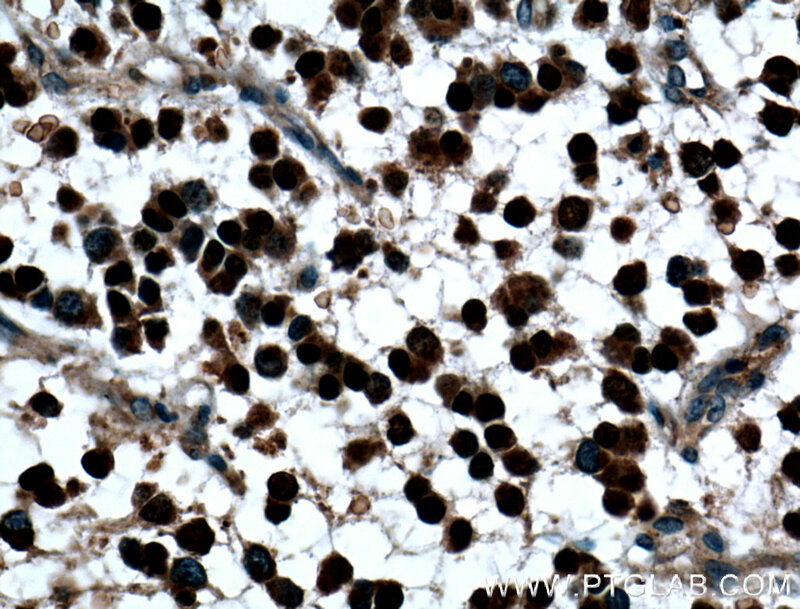 OLIG1 and OLIG2 are abundantly expressed in oligodendroglioma and nearly absent in astrocytomas. Therefore, OLIG proteins are candidates for molecular markers of human glial brain tumors, which are the most common primary malignancies of the human brain. 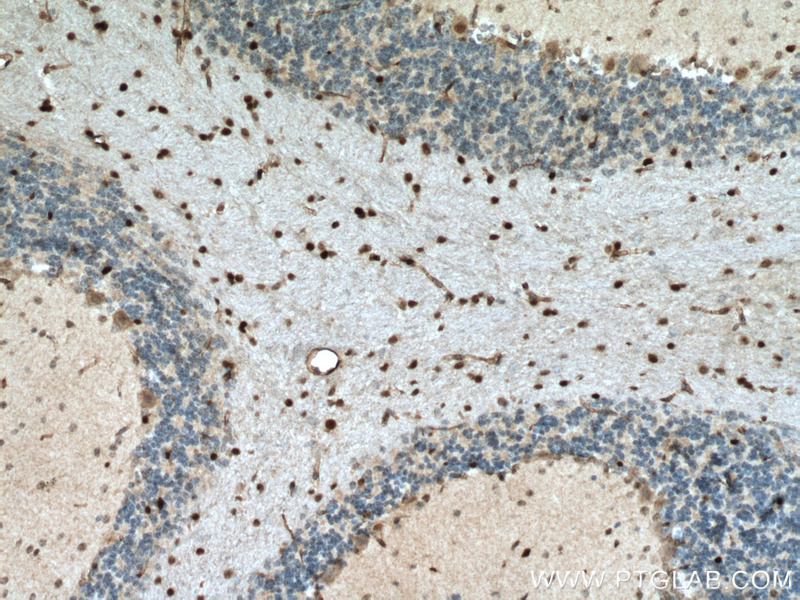 Immunohistochemistry of paraffin-embedded human gliomas tissue slide using 25754-1-AP (OLIG2 antibody) at dilution of 1:200 (under 40x lens) heat mediated antigen retrieved with Tris-EDTA buffer(pH9). 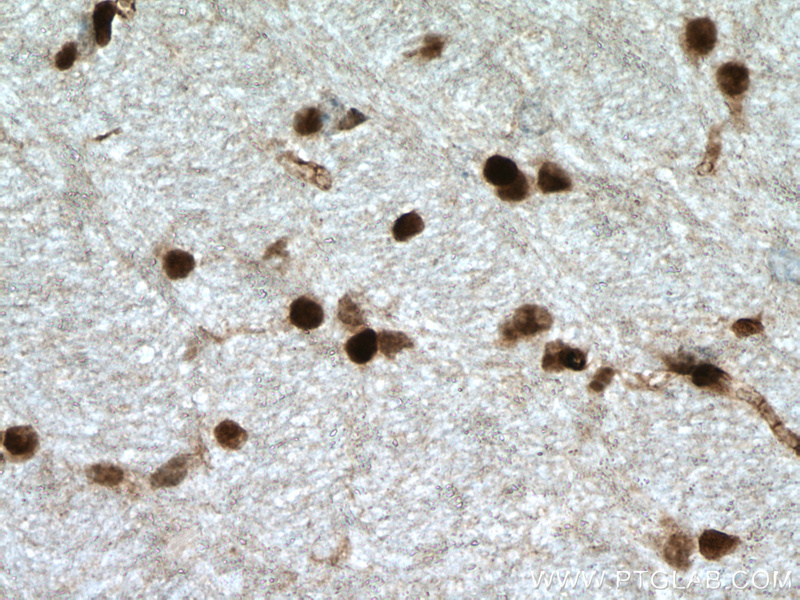 Immunohistochemistry of paraffin-embedded mouse brain tissue slide using 25754-1-AP (OLIG2 antibody) at dilution of 1:800 (under 10x lens) heat mediated antigen retrieved with Tris-EDTA buffer(pH9). Immunohistochemistry of paraffin-embedded mouse brain tissue slide using 25754-1-AP (OLIG2 antibody) at dilution of 1:800 (under 40x lens) heat mediated antigen retrieved with Tris-EDTA buffer(pH9). 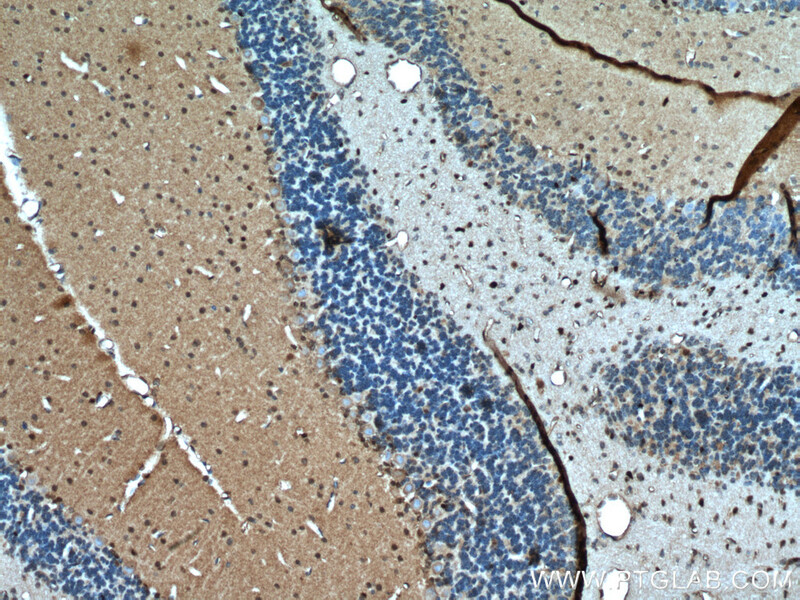 Immunohistochemistry of paraffin-embedded mouse cerebellum tissue slide using 25754-1-AP (OLIG2 antibody) at dilution of 1:400 (under 10x lens) heat mediated antigen retrieved with Tris-EDTA buffer(pH9). 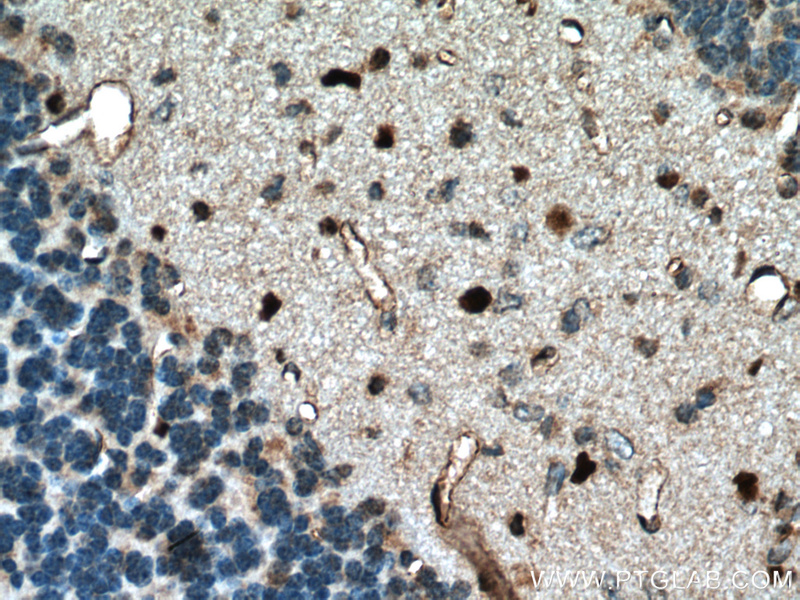 Immunohistochemistry of paraffin-embedded mouse cerebellum tissue slide using 25754-1-AP (OLIG2 antibody) at dilution of 1:400 (under 40x lens) heat mediated antigen retrieved with Tris-EDTA buffer(pH9).